I traveled to Vienna for the first time from October 22nd-27th, with stops in Berlin and Prague first. I built my trip around seeing Renée Fleming sing the Marschallin for the first time in Vienna, where Der Rosenkavalier is set. I had the most brilliant time and going to the Wiener Staatsoper was everything and more that I believed it would be. I love Renée in this role - and she loves singing it and acting it. I really believe it's her performance of this character is her best and most interesting and possibly most beautiful. Der Rosenkavalier is one of my most favorite operas and I've seen it at Chicago Lyric and many times at the Metropolitan Opera (with and without Renée). While in Vienna, I was able to see a second opera - Anna Bolena, which I also love. I had attempted to purchase tickets in advance but it was sold out. A few hours before the opening night performance, my friend and I were able to get the last two returned tickets at the box office. 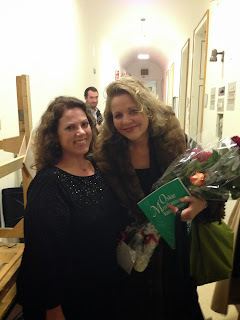 It was fabulous and I loved Krassimira Stoyanova as Anna. I sat in a loge seat above the orchestra and had the most amazing view of the stage and of all of the opera house. I've now seen Renée in five countries and countless cities in the U.S. I want to visit these cities anyway, so why not put a cherry on top with seeing my favorite opera singer? It's very satisfying for sure. The Berlin and Prague legs of my adventure were on my own. I really, really loved Berlin and I will definitely go there again. After the opera in Vienna and time in Berlin, my next favorite part of the trip was the train ride along the Elbe River into Czechoslovakia. The beer everywhere was pretty amazing as well. In Vienna, I met up with friends all of whom I've met because of Renée - wonderful friends who love Renée and opera and travel, from England, France, the Netherlands, Finland and Austria. I can't wait to see them all again...and I think I'll give Renée a list of the places I'd like to visit next. Wiener Staatsoper, a set on Flickr. I so enjoyed following your face and many beers throughout Europe. Brava!